The Little Lame Prince and his Travelling Cloak (often published under its shorter title The Little Lame Prince) is a story for children written by Dinah Maria Mulock Craik and first published in 1875. In the story, a young prince whose legs are paralysed due to a childhood trauma is given a magical travelling cloak by his fairy godmother; he uses this cloak to go on various adventures, and develops great wisdom and empathy in the process. Source: Craik M. D. (1875). The Little Lame Prince.London, England: Ludgate Hill. There is a christening and the nurse drops the newborn prince. the Queen dies. The young prince’s legs stopped growing causing him unable to stand or walk. The King dies and the Prince Regent (the King’s brother) comes to power until the prince is of age. They hold a funeral for Prince Dolor. We find that young Prince Dolor is not dead, but living with a nurse in Nomansland (a deserted country). His uncle faked the funeral having a wax figure of the Prince created. Dolor meets his godmother and she gives him a traveling cloak. Dolor would hide the traveling cloak in the cupboard. His godmother introduces herself as Stuff and Nonsense. She showed the young prince the mysteries of the cloak—which he didn’t understand at all. Prince Dolor finds that the magical traveling cloak can fly and can grant his wishes. He receives a pair of golden spectacles to see things he’d never seen before. The cloak takes him to other countries and he receieves a pair of silver ears (which will let him hear things he’d never heard before). He also sees another boy for the first time. Prince Dolor grows up. The nurse tells the prince about his past and that he is, in fact, a king. He meets a bird named Mag. The prince desires to meet the king. Prince Dolor goes to see the king and finds that he has died and a revolution is occurring amongst the townspeople. Dolor regrets wanting to see the world. The Prince awakens to find his nurse gone. The townspeople rejoice at the news that the prince was alive. The godmother appears to him again and tells him about the many forms she has taken to watch over him. Dolor became a great king and continued to fly his cloak as he grew older. He continued a long and happy reign and when he grew tired at the end of his life, his godmother took him away to Nomansland along with his magical traveling cloak. An evil prince and his mother, the queen, conspire to kill the prince’s brother who is good, kind, and handsome. The good prince (Leander) befriends a snake, which turns into a beautiful fairy. The fairy gives him a magical cap that can turn him invisible. A white fairy befriends a young prince. The fairy gave the prince a ring and tells him that whenever he did something unkind, the ring would prick his finger and he would lose her friendship. After several unkind deeds she turned him into a dog. Only changing his ways would bring him back to his handsome self. Because of a magician’s enchanted spell, a prince was born with a very long nose. He grows up to marry a beautiful princess, but the magician takes her away before the wedding. He travels all over the world in search of her and meets a rude fairy princess. He spies his princess behind a glass wall, but it wasn’t until he was able to admit to his nose’s size that the wall would break and he could marry his bride. A spoiled princess reluctantly befriends a frog, who magically transforms into a handsome prince. Clever Alice intends to marry Hans, but worries a great deal. First about a hatchet possibly killing her future child. Then her husband plays a trick on her when he sees her napping when she should be working. She becomes disoriented and unsure of her identity and runs from the town forever. Craik, Maria Dinah Mulock. The Little Lame Prince. Lit2Go Edition. 1875. Web. <https://etc.usf.edu/lit2go/31/the-little-lame-prince/>. April 19, 2019. 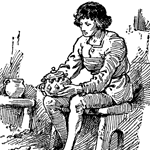 Maria Dinah Mulock Craik, The Little Lame Prince, Li2Go edition, (1875), accessed April 19, 2019, https://etc.usf.edu/lit2go/31/the-little-lame-prince/.